Our beloved Garry Herold Peterson passed away on August 24, 2018 at the Palliative Care Unit in the Red Deer Hospital. On July 5, 2018 it was discovered Garry suffered from a very aggressive brain tumor; he passed away peacefully surround by his loving family. Garry was 77 years of age. Born in Bentley, June 16, 1941 Garry lived on the farm all his life. He was a humble, hardworking farmer, who loved the land and said he felt closer to God in his fields then anywhere else. From the start life threw challenges his way, but he faced each new challenge head on and sometimes he challenged life right back with his daredevil attitude. He loved nothing more then being innovative and resourceful, often saying he never knew the meaning of the word “bored”. Through out his life, he volunteered with various local organizations and enjoyed many sporting activities and hobbies. 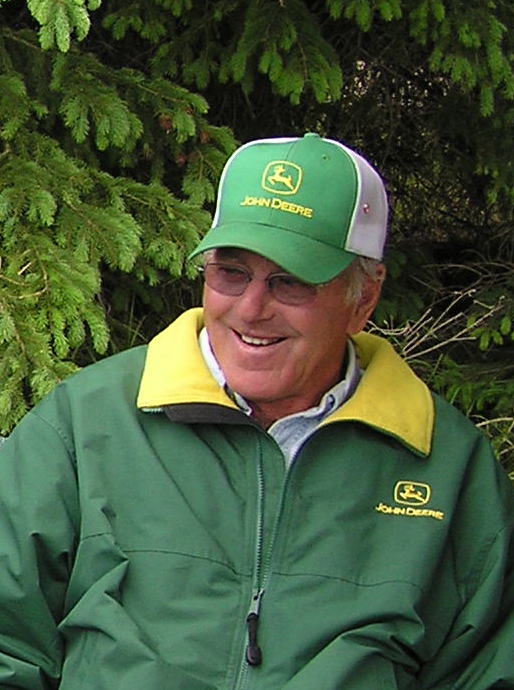 In later years, Garry thoroughly enjoyed being known for his collection of older John Deere tractors and machinery and was always willing to share his passion with those interested. Predeceased by his parents Herold & Rea, sister Janet, and infant siblings, Beverly and O’Brian, whom he said watched over him all those years. Garry will be loving remembered by his wife Linda as her Unsung Hero, as well as leaving behind, bins full of memories for his children, Matthew, Justin (Jen) and Angela (Mike), his treasured Grandchildren, Emily, Ethan, Bryce, Sydnie, Mason, Peighton, Delcan and Shayde, who will all dearly miss their very own Go-To, Mr. Fix Anything, Poppa. The twinkle in his eye and sly grin will be missed not only by his immediate and extended families, but also friends and neighbors. To honor Garry, we have chosen a food and fellowship get together, at the gymnasium of the Community Church in Bentley, 4824 50 St. for those who treasured having him in their lives. On October 13, 2018 from 1 pm to 3. In lieu of flowers, Donations may be made to Red Deer Palliative Center, Red Deer Regional Hospital Centre 3942 50A Avenue Red Deer, Alberta T4N 4E7 - or - Make-A-Wish Foundation of Northern Alberta, 16007 118 Ave NW, Edmonton, AB T5V 1C7. Or the charity of the donors’ choice.